With a Service Inspired Restaurants® gift card, you're giving more than just tasty food. You're giving fun with family and friends, a pleasant dining experience and great service. With over 60 Service Inspired Restaurant locations, there's a restaurant to suit anyone's taste! Gift cards come in any denomination and the card holder can easily check the balance online. 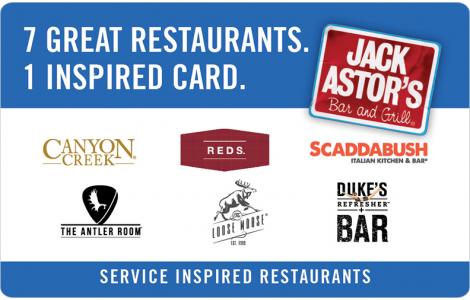 Service Inspired Restaurants® gift cards can be redeemed at Jack Astor’s Bar and Grill, Scaddabush, Canyon Creek Chophouse, Dukes Refresher Bar, Reds, The Loose Moose Tap & Grill and The Antler Room. Protect this card like cash. Card can be redeemed at any Service Inspired Restaurants® location. Present this card to your server when paying your bill. Balance remaining can be used towards your next bill. You can add value to your card at any of our restaurants. Check the balance of this card at any SIR Corp. location or online. Card is non-refundable and has no cash value. Card is not redeemable for cash except where required by law. If card is lost, stolen or used without authorization, it cannot be replaced. All the trademarks and associated logos, except Duke’s Refresher®, are property of SIR ROYALTY LIMITED PARTNERSHIP and are used by SIR Corp. and its affiliates under license. Value is in Canadian dollars. Issued by SIR Corp. Visit us at www.sircorp.com.